You must be familiar with Indian celebrity kids names like Sara Ali Khan and Jahnvi Kapoor. After all, being a celebrity kid in India comes with its own perks. The path to enter B-town is paved by the celeb -kid tag and they get instant love and attention wherever they go. I am sure you must have come across a zillion paparazzi pictures of Taimur Khan. Also, Aradhya Bachchan as she is Aishwarya’s baby. So, I am leaving them out of this list. (lol) But, here are the top Indian celebrity kids that you might not have seen lately. Especially, now that they have all grown up considerably. Check out the top 15 celeb kids in their current avatar. The precious daughter of Ajay and Kajol Devgan. Though the parents have kept her far far away from paparazzi, Kajol uploades pictures of Nysa on her Instagram profile. No wonder, she has grown up into a confident young lady is no longer a kid now. The younger sunshine of the Devgan family is Yug Devgan. 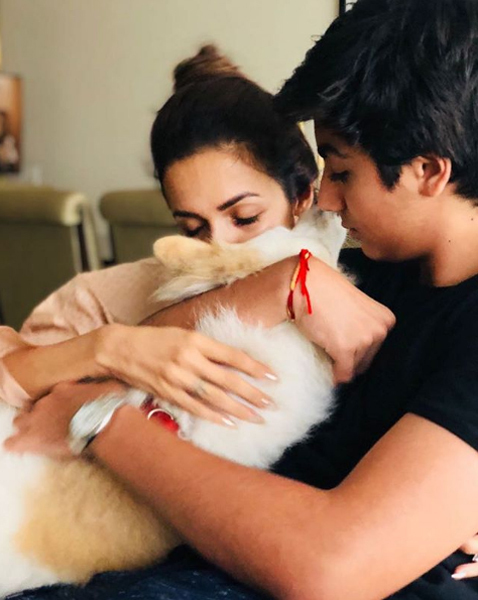 Apart from living a super cool life, Yug seems to be like every normal kid, as he has never been spotted by the shutterbugs doing flimsy activities (at least up till now). The latest picture of Yug was shared by Kajol on her insta account and it looks cute. The name says it all. Belonging to the gene pool of perfectionist Aamir Khan and the very talented Kiran Rao, this young sapling from the Khan empire looks super adorable. There were pictures doing rounds on the internet when he was born. And this is how he looks now. Everyone still remembers the extravagant wedding of Shilpa Shetty with Raj Kundra. The two are blessed with the star of their eyes, ‘Viaan’. The kid hasn’t been very popular in the B-town as of now given his very young age. But looking at the family picture, he sure as hell looks like he will do something big in future. The son of the cricket god. 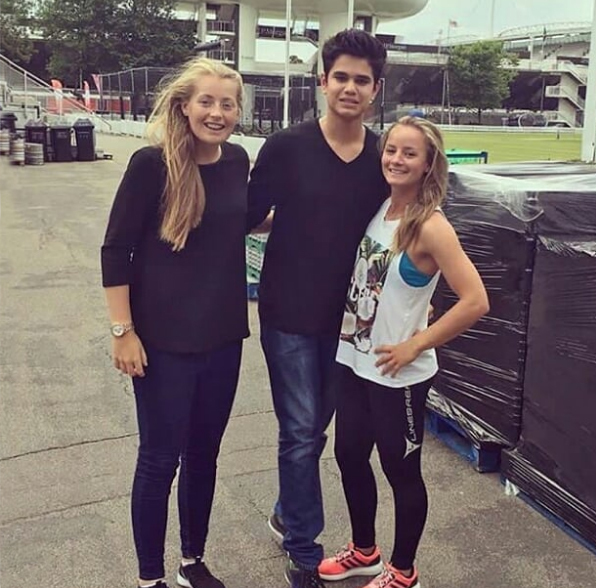 Arjun Tendulkar has all the charm his father Sachin had. The adorable face, strong determination and the zeal to do something big. No doubt he has started climbing the stairs of success on step at a time. He travels a lot and is equally interested in sports, which prove why all his pictures are of a stadium. The two sweet boys who look as dashing as their father have been known by all fans ever since they were born. 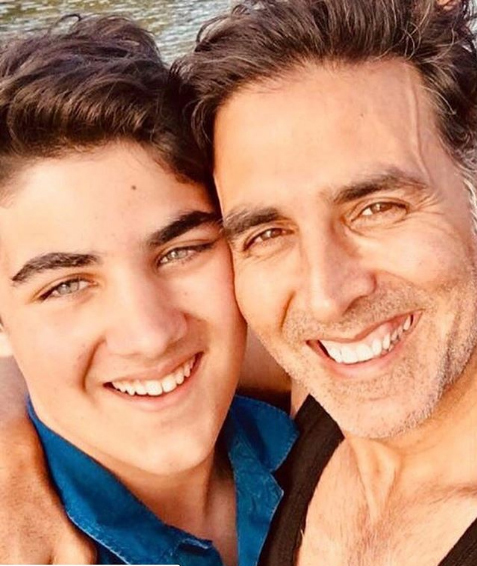 Hrehaan and Hridaan are the two sons of Hrithik Roshan and seem to have a good life even after their parents separated. This one is from trip father-sons had together in Kalahari desert in Botswana. Sushmita Sen’s is the hottest single mother. And her act of adopting a daughter has made everyone respect her more and more. Renne or as she calls her ‘Renee Shona’, is dearly loved by her mother. She seems to be good at dancing at this young growing age and is kept away from all kinds paparazzi by her mom. The diva, with caramel skin and classy poise ‘Lisa Haydon,’ turned heads with her pregnancy pictures and later gave birth to her son ‘Zack’. And trust me, she still looks like a fine young lady and not like someone who has a child and is a doted mother. Zack is a fun-loving kid and was spotted enjoying a holiday with his mum. 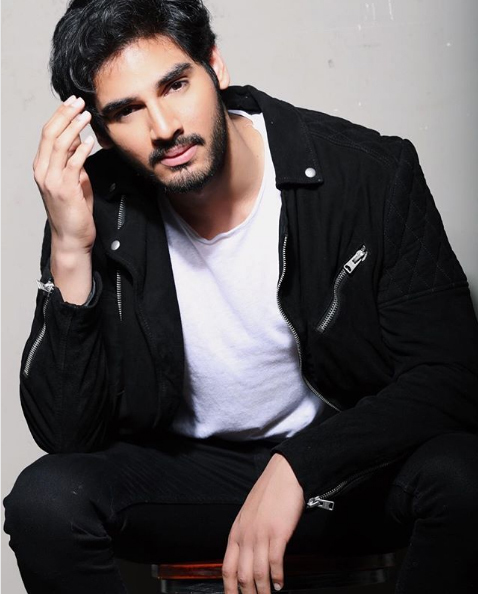 Son of Sunil Shetty, this handsome hunk has taken all the features of his father. Except for the fact that he has a lighter skin tone. He is all set to begin his career in the Bollywood industry. Since he has such good looks, he should easily pull off any given role. Let’s see how that turns out for him. The handsome Khan adds a star to the legacy of Khan’s. Aryan has been spotted quite often with his other siblings and dad alike. He is the eldest son of Shahrukh Khan and poses as the loving and caring brother for his younger siblings. She created headlines when she featured on the cover of Vogue. Definitely, it was around the lines of nepotism and media favouring star-kids. But that’s just what happens in B-town. 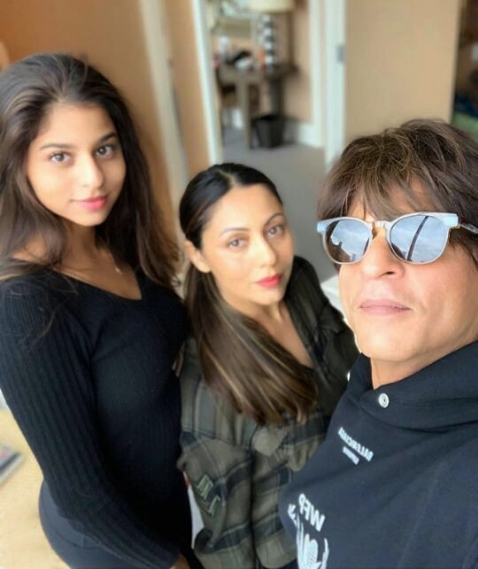 She is the only daughter of SRK and getting the perks of being King Khan’s daughter, she is just living the life she should. After being released from jail, Sanjay Dutt finally is having the family time with his loving wife and two kids. 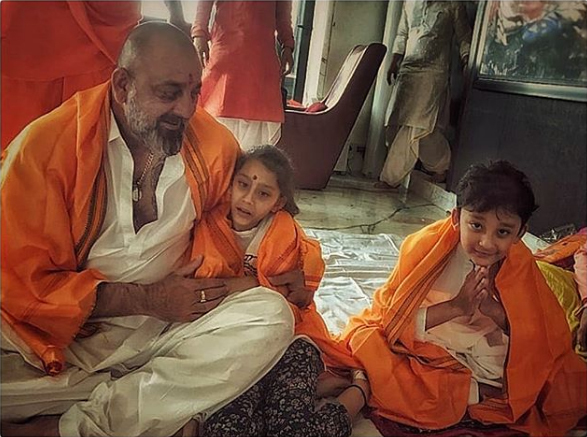 Both these kids are bundles of joy in Sanjay’s life and he shared this lovely picture of him sitting in a Puja along with his children. The little sunshine of the Kumar family, Nitara is the younger child of Akshay and twinkle. She loves animals and also loves spending time in the garden a lot. As you see, the pictures show mum and daughter spending a beautiful time in the garden. The pictures say a thousand words and Arhaan sitting next to Malika while she holds their pet just looks adorable. Arhaan is the only son of Arbaaz and Malika. Though the parents have gone separate ways now, Arhaan loves his family and loves spending time with his mom. Indian celebrity kids names have always been in trend given their unique choices of names and also the kind of lifestyle they have. Being a star kid has its own pros and cons. But I would say, its more pros and very minor cons. Sometimes, I wish I was a celebrity kid. But then, the reality hits and I kind of feel good that I can walk on streets without being groped for a selfie or face a hundred camera clicks on my way to the gym.